This book is an examination of the impact of Greek learning, literature, and religion on central aspects of Roman life in the middle Republic. Acclaimed historian Erich S. Gruen discusses the introduction of and resistance to new cults, the relationship between Roman political figures and literary artists schooled in Greek, and the reaction to Hellenic philosophy and rhetoric by the Roman elite. This book contributes new and important information on the place of Greek culture in Roman public life. 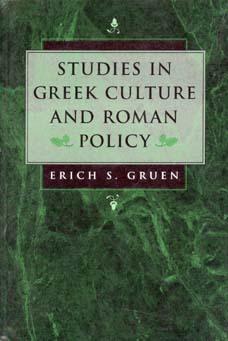 Erich S. Gruen is Professor of History at the University of California, Berkeley, and author of The Hellenistic World and the Coming of Rome and The Last Generation of the Roman Republic. Studies in Greek Culture and Roman Policy was originally delivered as part of the series of Louise Taft Semple Lectures at the University of Cincinnati.